The Special CBI court on Tuesday granted bail to LK Advani, MM Joshi, Uma Bharti and 3 others on a personal bond of Rs 20,000. Other accused in the case were granted bail in the matter at an earlier date. The court will formulate charges against all accused after the lunch. A Special CBI Court on Tuesday framed charges against BJP stalwarts L K Advani, M M Joshi and Uma Bharti and 9 others in the 1992 Babri Masjid demolition case. All 12 accused have been booked under IPC section 120 B, which means they will face criminal conspiracy case. Earlier, the court granted bail to Advani, Joshi and Bharti. Bail was also granted to BJP leader Vinay Katiyar, VHP's Vishnu Hari Dalmia and one-time Hindutva firebrand Sadhvi Ritambara, who also presented themselves before the court. All six were given bail on a personal bond of Rs 50,000 each by CBI Special Judge S K Yadav.Other six accused were already granted bail at an earlier date. 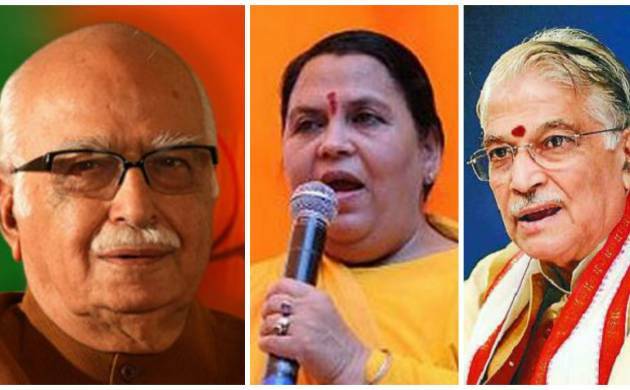 #1:25 PM: Special CBI court grants bail to LK Advani, MM Joshi, Uma Bharti and 3 others on a personal bond of Rs 50,000. Other accused in the case were granted bail in the matter at an earlier date. The court will formulate charges against all accused after the lunch. BJP stalwarts L K Advani, Murli Manohar Joshi and Uma Bharti appeared before a special CBI court in Lucknow for framing of charges of criminal conspiracy in the Babri Masjid demolition case. BJP leader Vinay Katiyar and one-time Hindutva firebrand Sadhvi Ritambara too presented themselves before the court in the politically sensitive case. Special CBI judge S K Yadav had said on May 26 that no application for an adjournment or exemption from personal appearance would be entertained. #11:00 AM: LK Advani reaches Lucknow to appear before special CBI court. He met UP CM Yogi Adityanath before reaching court. - Yogi meet Advani: Uttar Pradesh Chief Minister Yogi Adityanath on Tuesday met senior BJP leader L K Advani who is here to appear before a special CBI court in connection with a case relating to the 1992 demolition of the Babri Masjid in Ayodhya. The chief minister welcomed Advani with a bouquet of flowers as the former deputy prime minister stopped at the VVIP guest house before leaving for the special court. Yogi was waiting at the guest house for Advani along with other state leaders. Later, the chief minister held a meeting with Advani and other senior leaders. #10:30 AM: Uma Bharti reaches Lucknow, denies committing any criminal conspiracy or offence. "Whatever happened, happened in front of everyone just like movements in emergency period. Where is the conspiracy," she quipped before media on Tuesday. The court had on May 26 directed BJP stalwarts Advani, Joshi and Bharti to appear before it on May 30 for framing of charges in the case. Special CBI judge S K Yadav had also asked three other BJP leaders—Vinay Katiyar, Sadhvi Ritambara and Vishnu Hari Dalmia—to present themselves before the court in person on that day. He said no application for adjournment or exemption shall be entertained. The court which is hearing two separate cases, has already fixed May 30 for framing of charges against Mahant Nritya Gopal Das, Mahant Ram Vilas Vedanti, Baikunth Lal Sharma alias Prem Ji, Champat Rai Bansal, Dharma Das and Satish Pradhan in the other matter. The apex court had on April 19 directed that Advani (89), Joshi (83), Bharti (58) and other accused in the case would be prosecuted for serious offence of criminal conspiracy in the politically sensitive 1992 Babri Masjid demolition case. It had also ordered the day-to-day trial to be concluded in two years. The top court, which had dubbed the demolition of the medieval-era monument as a “crime” which shook the “secular fabric of the Constitution”, allowed the CBI’s plea on the restoration of the criminal conspiracy charge against the BJP stalwarts. However, the Supreme Court had said Kalyan Singh, who is the Rajasthan Governor and during whose tenure as the chief minister of Uttar Pradesh the disputed structure was razed, is entitled to immunity under the Constitution as long as he holds the gubernatorial office.